KAMILLAH, Grey mare, *2004 (Imperial Kamilll / Kateefah). Breeder & Owner: Mrs. Judy Phillips. 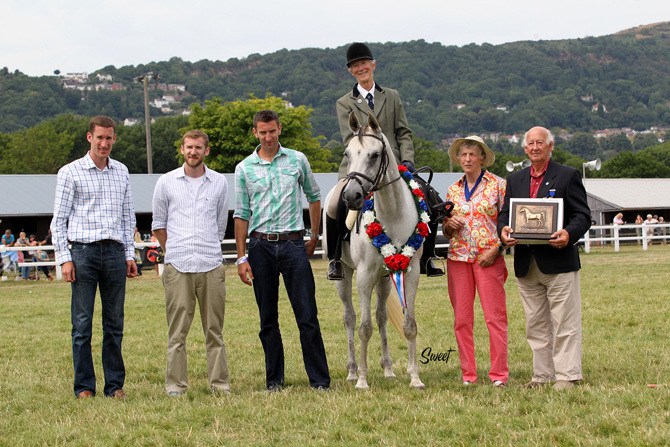 The Arab Horse Society selected the mare Kamillah as their WAHO Trophy winner for 2013. The award was presented at the AHS National Championships Show. Judy Phillip’s young home-bred mare is of straight Egyptian bred bloodlines, she is a very worthy winner of this prestigious Trophy having repeatedly and emphatically proved her outstanding versatility. She has won in halter classes and also been placed in Novice ridden classes. Away from the show ring she has taken part with success in combined training, show jumping, dressage, and Pony Club express eventing, enthusiastically flying the flag for the Arabian breed in open competition. She has also seen hounds and been ridden side-saddle. Of particular note is her achievemt in attaining Grade 1 status in the National Stallion Association’s Performance Test. She was the first Arabian mare registered with the AHS to take this important test, and as a result she was awarded AHS Grade A Premium Performance status. Kamillah and her owner, Judy Phillips. Photo credit Eric Jones. Not one to rest on her laurels, this tough, sound and happy little mare has also proved to excel at the demanding sport of endurance. In 2012 Kamillah became Endurance GB’s Reserve Novice Champion, her results included nine rides at Grade 1 and one at Grade 2. Also in 2012 Kamillah was placed third in the Arab Horse Society Purebred Performance Horse awards, having also competed in dressage and show jumping in the same year.